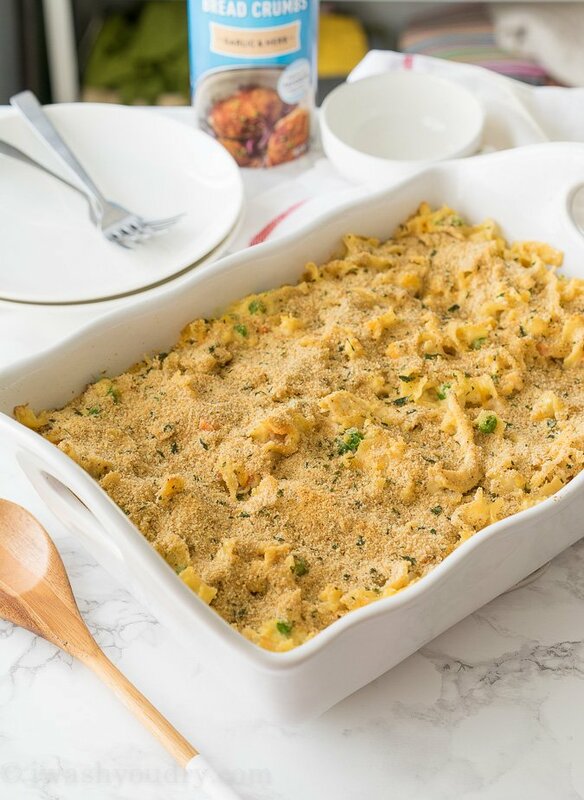 This Easy Chicken Noodle Casserole is a quick to prep dinner that brings all the comforts of a bowl of chicken noodle soup. Heat oven to 350°F. Spray 13×9-inch (3-quart) baking dish with cooking spray. Cook and drain 12 oz egg noodles as directed on package; set aside. In large bowl, mix 4 cups chopped cooked chicken, 2 cans (10 oz each) cream of chicken soup, 1 1/2 cups sour cream, 1 cup shredded Cheddar cheese (4 oz) and 2 cups frozen mixed vegetables. Add cooked noodles; stir to combine. Season with salt and pepper to taste. Spread mixture evenly in baking dish. Top with 1 cup Progresso™ Bread Crumbs Garlic and Herb. Lightly spray top with cooking spray. Bake 25 to 30 minutes or until center is bubbly and heated through. Use equal amounts chopped ham or turkey in place of the chicken. This casserole is freezer friendly! Just cover tightly and freeze before adding bread crumbs. To reheat, bake until bubbly in center, then add the bread crumbs, spray with cooking spray, and bake until topping is golden brown.